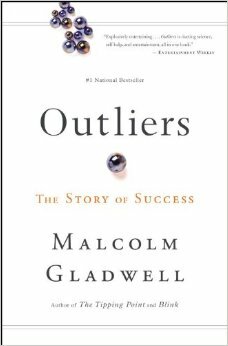 Malcolm Gladwell’s Outliers (Little, Brown & Co. ) is not a new book. In fact it’s over eight years old, but it is one that I’ve read lately. As in the other Gladwell books (The Tipping Point, Blink), the author picks a subject and expands on it, or as he explains in his website, I write books when I find myself returning again and again, in my mind, to the same themes. Said theme for Outliers was, and I liberally interpret: Why do some people become successful and others, who are just as educated and innately intelligent, don’t? This is a question I have posited myself, as I have seen some people rocket to the top of their chosen profession while many of their peers struggle and remain perennially in the backfield. So I picked up Gladwell’s book hoping to find not so much answers as explanations, and I certainly received what I was searching for. Not that it made me feel any better. In fact, there’s a simple word to explain exactly how I felt. As Gladwell theorizes, it’s not how hard you work, but how advantageous you were in where and when you were born, and how the culture in which you developed shaped you. In essence, as hard as some people work to succeed, the vast majority of those who do find success do so aided by circumstances beyond their efforts. Or as the author puts it: …we vastly underestimate the extent to which success happens because of things the individual has nothing to do with. Now, who hasn’t heard the stories? The accountant who just happens to send his resumé in on the day another accountant gets fired, and gets hired, purely out of necessity. The actor who gets to star in a blockbuster film after the first pick for the role turns it down. Or as in Bill Gate’s case, growing up in Seattle the son of a wealthy lawyer whose private middle school, in 1968, was able to afford a unique computer for him, and a few other select geeks, to use on their own. A computer, tied to a main-frame up town, which Bill and his cohorts got to use day and night and weekends and all summer until all they did was program and program and program, until this coding-jones replicated exponentially into Microsoft. My God, how could you compete with those innate set of circumstances? Because part of what Gladwell expounds on, what ultimately leads to Bill’s success, lay not so much in the advantages, as the time he spent perfecting his craft. His 10,000 hours. You may as well know, I’m an academic. I have a Master of Fine Arts degree in Writing and at the time my thesis, a novel, was in progress, I was working on a three-book contact. So, in one ten-month period, I wrote one 80,000 and three 50,000 word novels, as well as several papers, four grant proposals (I minored in grant writing), and two short stories. This is addition to all the ancillary writing that goes along with the business of submission and course requirements, so I spent many a weekend from sun-up to -set still in my dressing gown, gaining my sustenance by anything I could eat with one hand. At times, it wasn’t a pretty sight, but it was always exhilarating and ultimately very rewarding. The end result is I can drop prose like others drop trou, and now I get to teach people how to do it. I’m not perfect, I’m still a work-in-progress, but I can honestly say I love what I do. And if you can say that, well then, your working days are done.